Barcelona. Home of Gaudi and creative city extraordinaire, this incredible location is the capital of Catalunya and a great port destination. 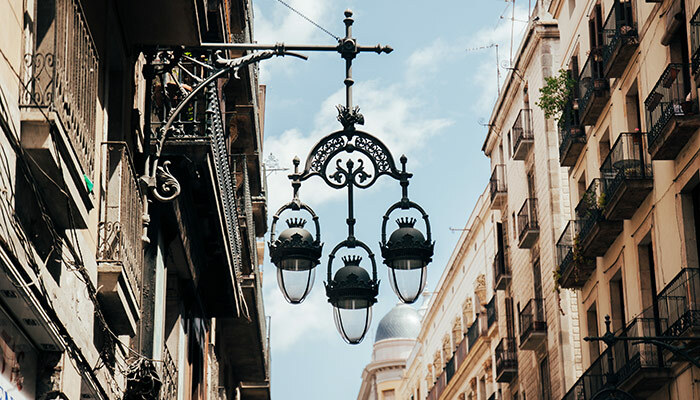 Its effortless charm has attracted people from around the globe, and there is plenty to discover in the cobbled streets of the Gothic Quarter and on the wide sweeping broadways of Eixample. Leave no stone unturned in your mission to unearth all of the city's secrets, as you stroll from the bottom of Sant Antoni to the top of Gracia. You are, quite frankly, welcome to this splendid city. Take a look at our all-encompassing guide of Barcelona, barrio by barrio. If you're emerging from Sants Estació, Sants appears to have little to offer on first sight. A number of uninspiring grey blocks serve as cheap hotels and, beyond that, an uninspiring road to the much more interesting Plaza España. However, give it a chance and Sants may actually turn out to be your favourite destination of the trip. Instead of heading straight to the centre of town, explore the narrow alleyways until you discover the various squares - Plaza de Sants, Plaza de Centre and more. These are far less busy than the more touristic centre and you're much more likely to find the locals snacking on patatas bravas or sipping vermouth. Sants is a particularly lively place during the summer when the annual Sants festival sees free concerts performed in its various squares and labyrinthine streets. People of all ages can be seen dancing salsa, singing along and just enjoying the atmosphere. Pushed up against Montjuic, it's almost easy to forget Sant Antoni is there. After all, unless you're getting the funicular to Montjuic, there's not a lot here that is commonly advertised in the guidebooks. However, if you don't visit, you're missing out on some fantastic architecture, as well as a plethora of second-hand bookshops. Near Paral-lel metro station, you'll also find a creative space where modern art, graffiti artists and skateboarders can be found many evenings, enjoying the crisp air and a bit of banter. Barcelona's central district is neatly arranged in a large grid, with wide streets that are lined with silver birch trees. 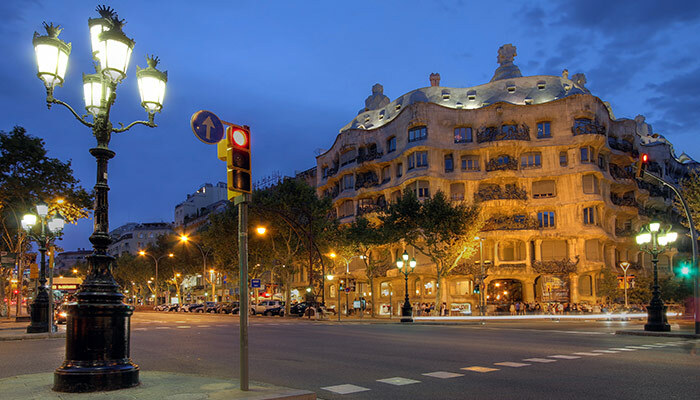 There is lots to see here, including the gay scene (on and around Carrer Muntaner), the most expensive street in Spain (Passeig de Gracia - great for shopping) and a number of Gaudi creations (Casa Batllo and La Pedrera among them). Plaza Catalunya also forms an integral part of this barrio, serving as a centre for festivals and events. The barrio of Raval extends out of the Gothic quarter and is something of a Jekyll and Hyde destination. On the one hand, you have the modern elements such as the cinema and the Plaza de Vázquez Montalbá. But tucked away, you'll find street markets alongside cafés and bars that are as Spanish as can be. They're quirky as well, and thoroughly hospitable. Also of note here is the splendid statue of a giant cat, crafted by Fernando Botero, who was renowned throughout all of Spain for his charismatic constructs of animals. While much of Las Ramblas may have lost its charm to tourist shops and overpriced restaurants over the year, the same fortunately cannot be said of the rest of the Gothic quarter. This tangle of personality-filled alleyways is well worth exploring, with plenty of intimate corners and plazas, nooks and crannies. The shops here sell an incredible array of products, but be advised that they generally close for siesta. Evening is a particularly enjoyable time to walk these streets, particularly on a weekend - every place has just reopened and the atmosphere is incredible. Getting lost in the intricate streets of Born is an experience to be treasured. Everything from its beautiful high street (complete with cathedral, market and plethora of bars) is absolutely stunning. The market building dominates the central square; years ago, it was decided that the actual market should be moved away to another area. Debate raged over what to do with the building itself, and everyone was set on a library until excavations uncovered a labyrinth of Roman streets beneath. Now, the market functions as a cultural centre, with the remains on display for all to see. You'll also find a great history of Barcelona and Catalunya contained within. 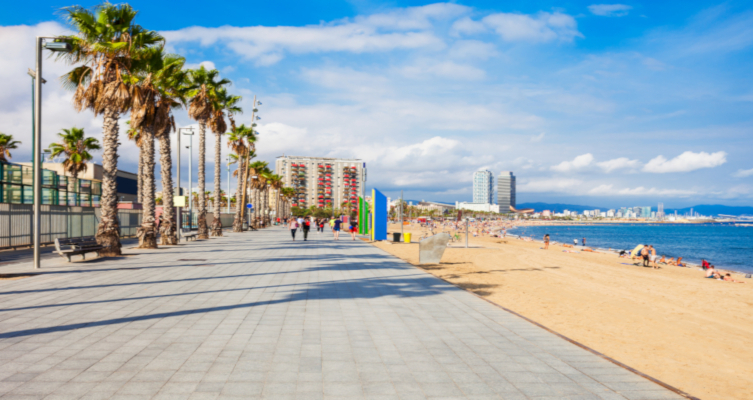 A brief wander along Barcelona's main promenade might leave you under the impression that it's a bit of a tourist trap, but this is not the case. Penetrate the main walk to the beach and you'll find plenty to be impressed by, not least its thriving main square. Just off here, you'll find plenty of intimate tapas bars and places to enjoy a cheeky drink. Barceloneta is famous for its beach, but the main one gets packed during the day. Head north to Marangell or even hop on a train to find the best beaches. 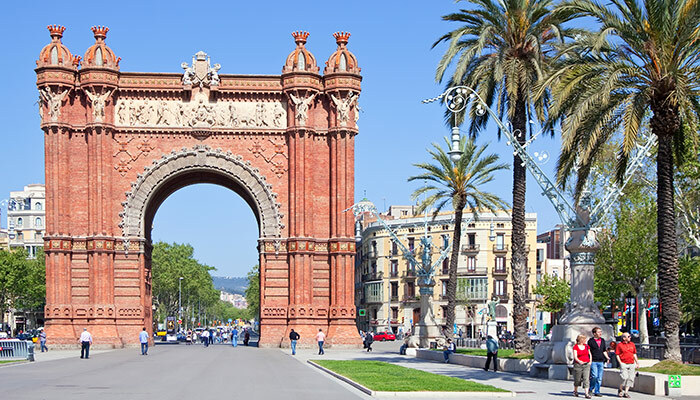 Home to a number of tourist attractions, it would be most unwise to miss out on Arc de Triomf during your time in Barcelona. The splendid Parc de la Ciutadella, the endearing Barcelona Zoo and of course its eponymous monument, there is plenty to see here. And the Sagrada Familia isn't far away either. For a really impressive view of the cathedral, be sure to walk up along Carrer de la Marina. You'll also get a good look at the disused bullring - now the Museu Taurí.